Polyurea Roof Coatings Are A Great Option For Metal Roofing Systems. 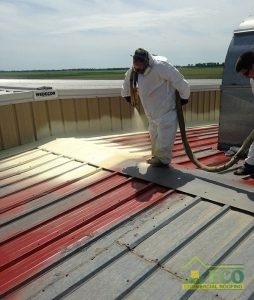 There are many unique roof coatings on the market for installation on roofing systems, but none of them are as functional and defensive as polyurea roof coatings. Polyurea roof coatings are simple to apply, adhering to many different roofing construction materials such as wood, metal, and even concrete. Protecting your roof against damage, this coating offers dependable protection and water resistance against standing pools. You will never have to worry about bad weather rescheduling when you decide to install this coating as its water resistance gives it a bigger window for application. The quickest and easiest application is yours when you have this quick applying and curing coating service. ECO Commercial Roofing offers your building fast and easy polyurea roof coatings in Texas, Louisiana, and Mississippi. Our expert roofers are always available to help you and provide you with the quality roof restoration services you need for your roof. Want more information about how polyurea roof coatings can benefit you? Give us a call today at (833) 200-0571 to learn more or get started! Many clients select a polyurea roof coatings for their water resistant aspects, but there are more benefits that polyurea has to offer. While water resistant, this coating is also repellent to other threats such as chemicals and environmental damage. Abrasions from debris and storms are repelled by this coating’s durability, resisting damage. Metal roof systems stay stronger longer and protect your roofing with corrosion protection from an applied polyurea coating. If you have special concerns about your roof, polyurea roof coatings can be uniquely infused due to its versatile nature to provide you with even more advantages. The most popular benefit the polyurea is blended for is added UV resistance for their roofing. As with other cool roofing options, UV rays can be reflected away from your property, offering you additional energy efficiency once your polyurea roof coatings are applied. At ECO Commercial Roofing, we supply all of your roofing solutions. Our roofers set out to supply you with quality roofing services and a great customer experience every time. We take the time to listen to your roofing needs, ensuring you get the best materials and repairs for your roof. Our team of skilled roofers is always on hand to help you no matter what your roofing service need may be. Let’s begin today. Give ECO Commercial Roofing a call today at (833) 200-0571 for polyurea roof coatings in Texas, Louisiana, and Mississippi!